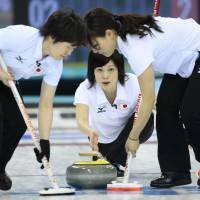 SOCHI, RUSSIA - The Japan women’s curling team bowed out of the Sochi Games on Monday after losing its final round-robin match 8-4 against Sweden, which moves on to the playoffs along with Canada, Britain and Switzerland. Sweden scored first with two points in the second end, with Japan just barely managing to match its opponent before conceding a further two points in the third end. Japan skip Ayumi Ogasawara was in particularly poor form against the two-time defending champion, coming up short on an easy attempt at a point in the fifth end to allow the Swedes to steal it away. Ogasawara again flubbed the final stone in the sixth end to settle for just one point. A steal in the seventh end was not enough as Sweden added to its lead until Japan ran out of stones. Japan earlier in the day had kept alive hopes of advancing with an 8-5 win over China for a three-way tie for fourth in the standings with its Asian neighbor and Switzerland. In other late matches, Switzerland held on to an early lead against China for a 10-6 win and a place in the playoffs. Undefeated Canada finished at the top of the table with a 9-4 win over South Korea, while Britain advanced despite losing 8-7 to Denmark. In Wednesday’s semifinals, Canada plays Britain and Sweden goes up against Switzerland, with the winners to meet in Thursday’s gold-medal match.